Budget-friendly, but at what cost? 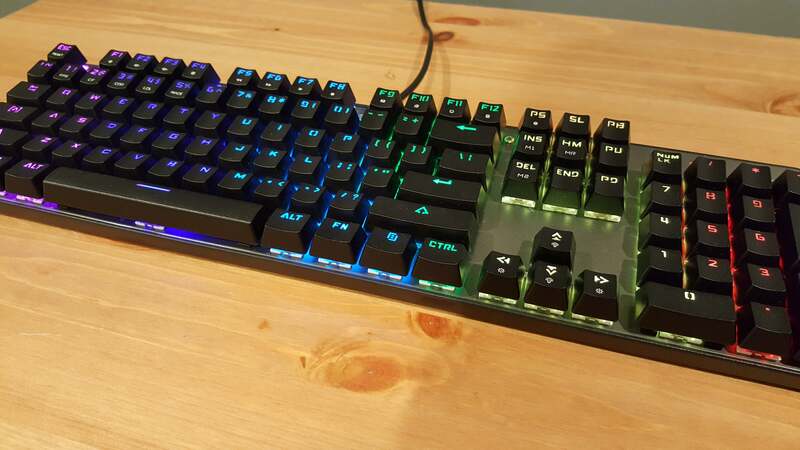 An RGB-enabled keyboard for only $80—too good to be true? That was the question I asked myself while agreeing to look at the Aukey KM-G3. I mean, the thing is less than half the list price of RGB boards coming out of Logitech, Razer, SteelSeries, and Corsair. Well, it’s not made by Aukey. That’s the first catch, I guess—though it doesn’t matter much in the grand scheme of things. This is, as far as I can tell, a rebrand of the Motospeed Inflictor CK104. Consider this a review for both. The second catch? It doesn’t look great. I’m a fan of the KM-G3’s slim bezel-free design. It gets that part right. But the way the exposed brushed-metal backplate meets the plastic chassis rubs me the wrong way. Nor do I love the four visible screws running across the top. The overall look isn’t terrible, by any means—I’ve seen worse keyboards from better-known companies. There’s just no artistry to the KM-G3. It’s a very utilitarian no-frills device, and I feel like it might’ve been better off with a plain, all-black plastic casing. At least then it wouldn’t draw attention to itself. The third catch is the keycaps. You can replace these, provided you’ve got a spare set of Cherry-style caps sitting around—or you order some. But let’s go over the two issues: First, the keys that come with the KM-G3 are notably cheap-feeling, made of a thin and flimsy plastic. I don’t know how many people would recognize this fact, especially in isolation, but it’s immediately apparent when you put the KM-G3 next to any high-end mechanical keyboard. The keys on other boards feel ever-so-slightly thicker, more durable. 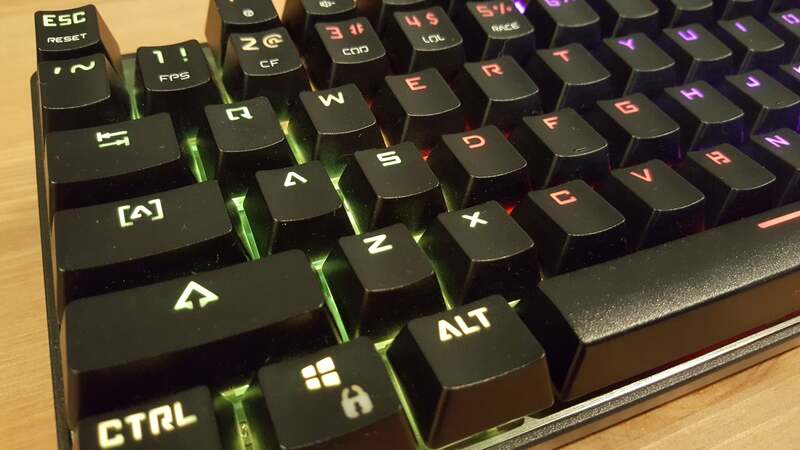 This wouldn’t be such a big deal on a normal keyboard, but on an RGB-lit keyboard you have so much light shining through these ugly keys all the time. It somewhat undercuts what should be the standout feature. That being said, the lighting is well done. 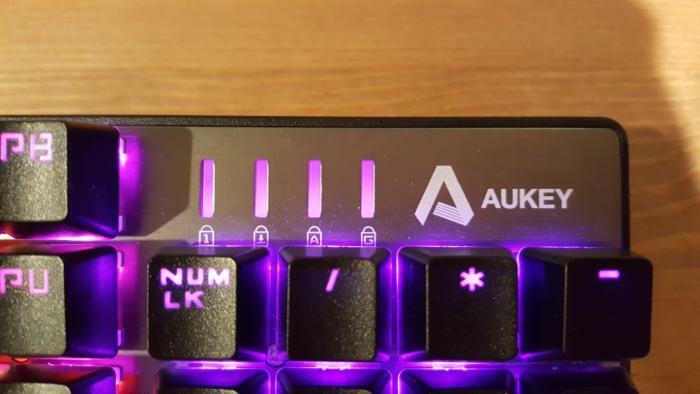 I’m disappointed that there’s no software method to individually control the lighting of each key—after all, with per-key lighting you’d think Aukey would want to let you take full advantage. The lighting’s not as bright as you’d find on a Razer, Corsair, or Logitech board, but for $80? Not too bad. The final catch is that the KM-G3 doesn’t use Cherry MX switches. Instead, it sports Outemu Blues. Oh, they look like Cherry MX Blue switches—specifically the RGB variant designed in partnership with Corsair. It’s got the familiar plus-sign Cherry stem, with a single LED embedded above each switch and shining through a clear plastic housing. On the surface, they’re pretty good clones. Unfortunately this means the lighting is pretty uneven—and this applies to Cherry boards as well as this Outemu board. As with Corsair and Razer devices, keys tend to have good lighting at the top and weak lighting at the bottom, resulting in lettering placed at the top of the key. Even then, you’ll notice some dark spots towards the bottom of many keys (like the arrow on the Shift key). It also means secondary functions, like the media keys, aren’t illuminated. On the upside, you (sort of) get that tactile Cherry Blue feel. Halfway through pressing a key you’ll feel (and hear) a click, well before you bottom out. It’s great for typing, putting less strain on your wrist. There are some differences between Cherry keys and these Outemu knockoffs, though. The Outemu switches have a harsher tactile click to them, noticeable both in how they feel and how they sound. This is without a doubt one of the loudest mechanical keyboards I’ve used short of a buckling spring design, with a low-pitched clack for each key press. Keys on the KM-G3 also feel more wobbly than any of my Cherry Blue boards. I don’t think the Outemu Blues are bad per se, but they’re definitely different. Some people might prefer them. Others (particularly Cherry Blue devotees) probably will find them rattly and a bit imprecise. But again: This is an $80 keyboard. One that’s often on sale for only $60. (Right now, it’s $65 on Amazon.) Considering the $120 to $180 asked by many of the more mainstream manufacturers, the Aukey KM-G3 is one hell of a deal. You get a basic RGB-enabled keyboard at a much more palatable price, and without compromising usability. Oh sure, it could look prettier, but with $100-plus in savings you could easily go ahead and buy all-custom keycaps if you’re really concerned. You do indeed get what you pay for, and there’s always going to be room for higher-end features. 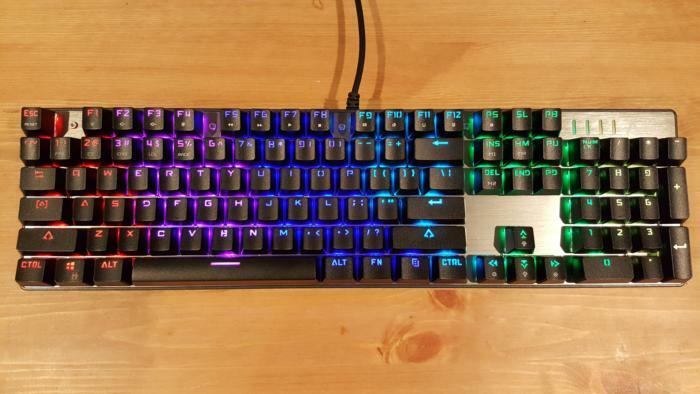 If you’re looking to get started with a mechanical keyboard or even an RGB mechanical keyboard at a budget-friendly price, though, the KM-G3 ain’t half bad. The Aukey KM-G3 isn't the best keyboard, but at half the price of the competition it's a good budget-friendly option.